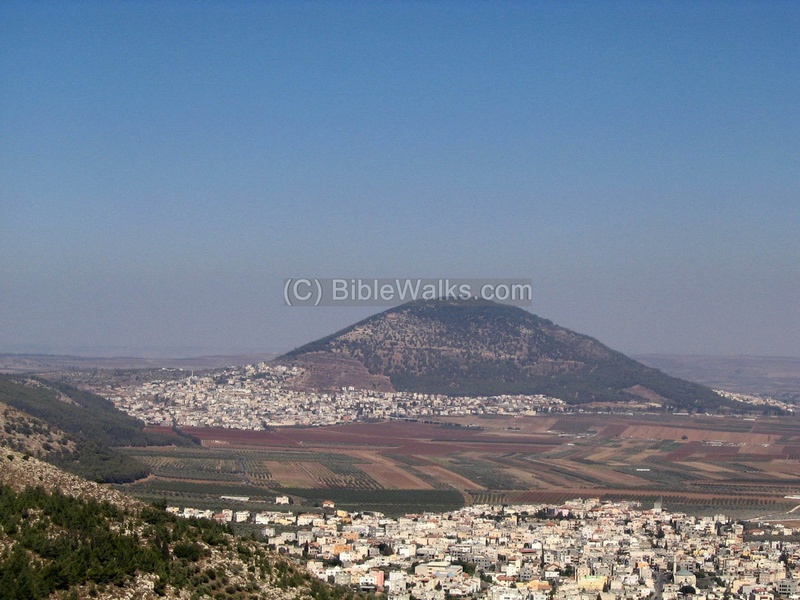 Mount Tabor is a steep round hill on the north-east side of Yizreel valley. It played an important role in the biblical history, and tradition links it to the Transfiguration of Jesus. 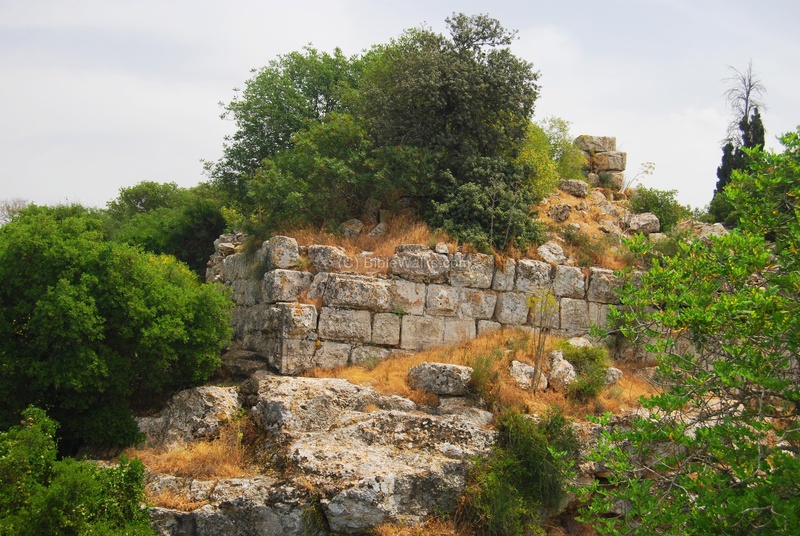 The hill is strategically located on the main north-south ancient road, and was an important fortress during the First and Second Temple, Greek, Roman and Crusaders times. Jeremiah 46:18: "... Surely as Tabor is among the mountains... so shall he come." 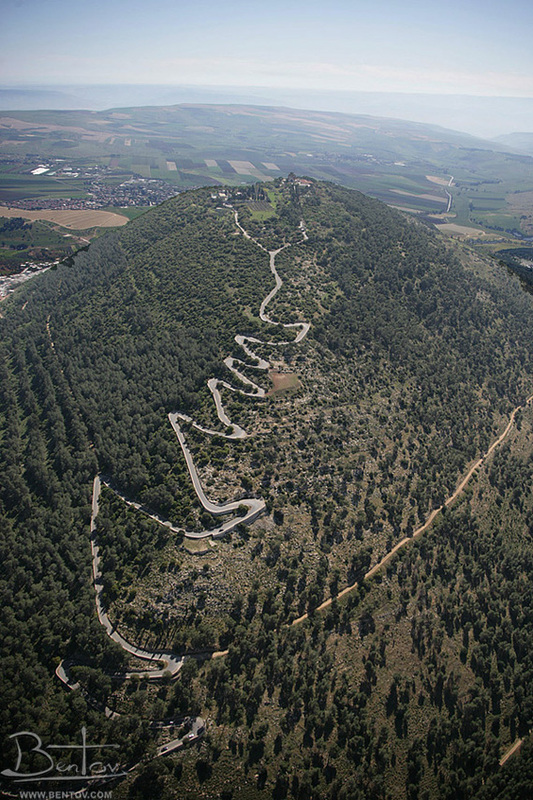 Mount Tabor is strategically located on the main north-south ancient road, and for most Christians it is a Holy mountain - "the mount of Transfiguration". It was an important fortress during the First and Second Temple, Greek, Roman and Crusaders times. 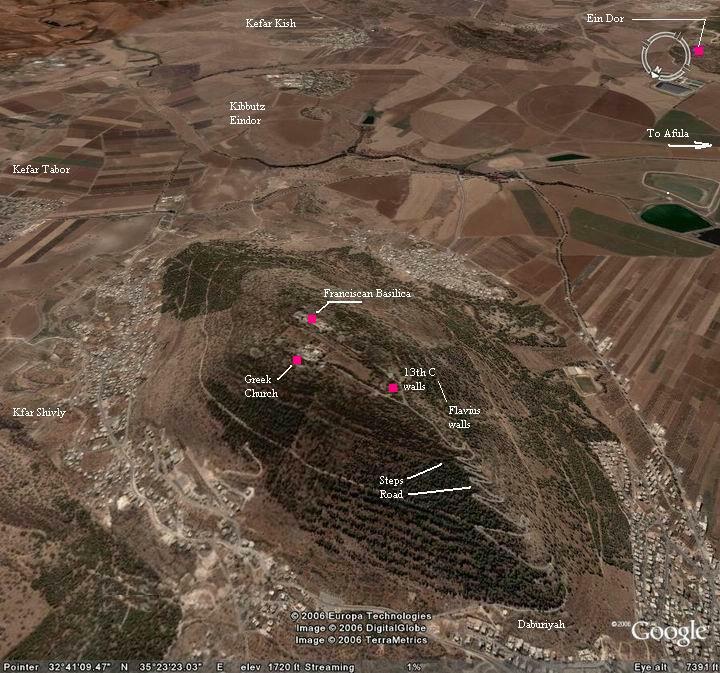 This page is an overview of the topography, history and sites on mount Tabor. Additional web pages detail various sites on the hill. 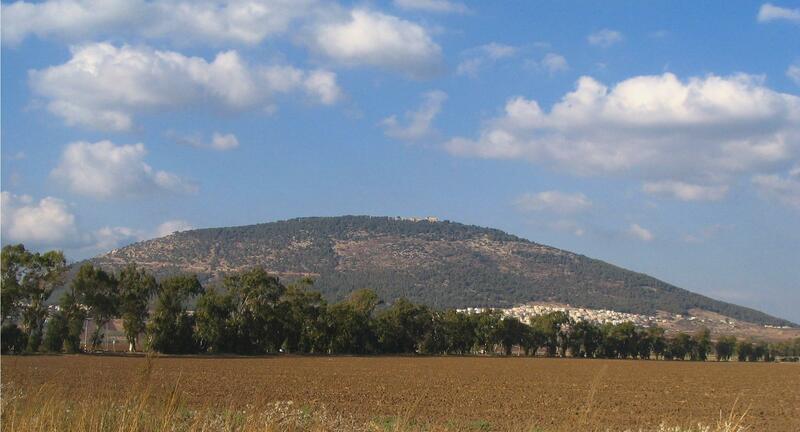 Mount Tabor is located 9KM east of Nazareth, at the north-east corner of the Yizrael (Jezreel) Valley. It is a round steep hill (613M above sea level, and 460M above the valley), visible from the whole area. 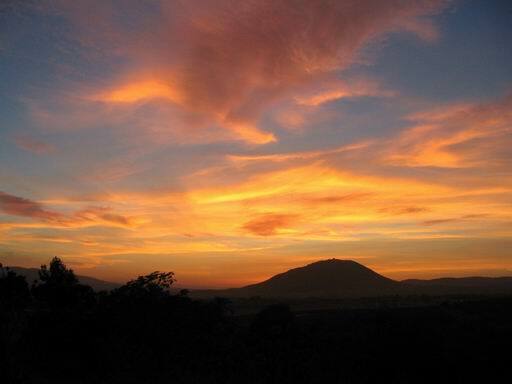 It is not an extinct volcano, although it does look like one. It had a prime location in the ancient times, and there were several roads that crossed it: Via Maris (Yizreel valley to sea of Galilee), lower to upper Galilee, Jordan valley (via Tabor creek), and Beit Shean via Ein Dor and around the Moreh hill. From the hill there is a magnificent view of Jezreel valley, the hills around it including Givat Hamoreh, and to the North - Mount Hermon (as written in Psalms: "Tabor and Hermon shall rejoice in thy name"). The following aerial view shows the points of interest. Note the winding road that crawls up the hill, up the height of 300M. On top of the hill there are 3 sections: the Franciscan basilica area (south-east side), the Greek church area (north east side), and the Flavius ruins (west side). You can point on the red dots in order to navigate to the selected point. A view of Mount Tabor from Mount Precipice, near Nazareth. On the bottom of the hill there are several Arab villages, including Deburiah seen in the photo below on the foothills of Tabor. In the foreground - the Arab village of Iksal (the village maybe referred in Joshua 19: 12 as "Chisloth-tabor"). A closer look from the road near EinDor, on the south side of the mountain. On top of the hill you can see the buildings of the Monastery. The Franciscan basilica, the tallest in the compound, and the hostel (Casa Nova), were built in 1921-1925. There were earlier churches: in the 6th C there were 3 churches; in 803 there were 4 churches and one monastery; in 1101 a larger church was built, and destroyed by Saladin in 1183. In 1228 it was rebuilt, but was destroyed in 1263. In 1873 a small church was built, followed by the modern compound. The site is accessible only from the north side, by a winding narrow road. 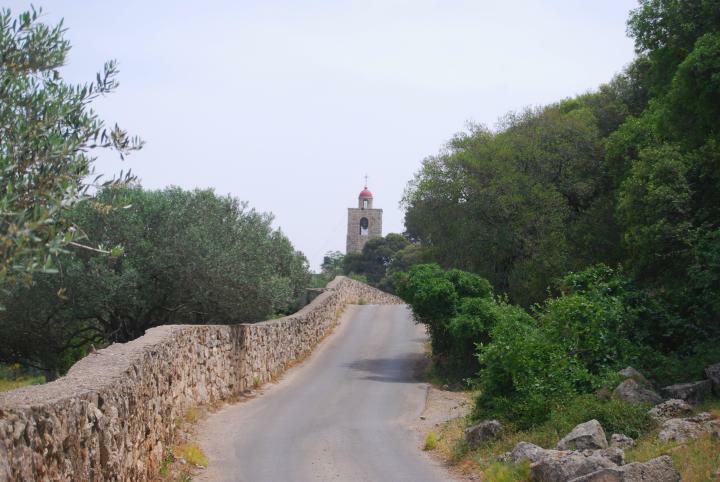 Walking or Biking up the hill is a real challenge: for Walking, there are 4,300 steps that were built in the 4th C AD and serviced the Christian pilgrims. At the top side of the hill lie vast ruins and walls of the ancient city, where you can park and enjoy a picnic with breathtaking views. Additionally you can visit the churches compound. On the south-east side of the top of the hill is the Franciscan monastery, with its grand Basilica seen in the photo below. More details and photos are expanded in a separate page. On the north-east side of the top of the hill is the Greek-Orthodox monastery. More details and photos are presented in a separate page. 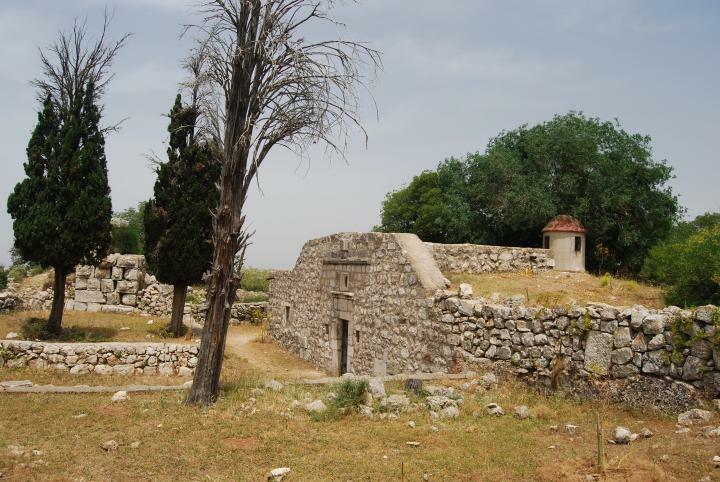 Around the top of the hill are sections of the 13th C Crusaders/Ayoubi walls, towers and ruins of structures. There are also traces of ruins of the Roman period walls. The tower on the north-west side is seen in the photo below. On top of the hill are several other ancient structures, chapels, cisterns and quarries. Mount Tabor is also a popular launching site for hang gliders. 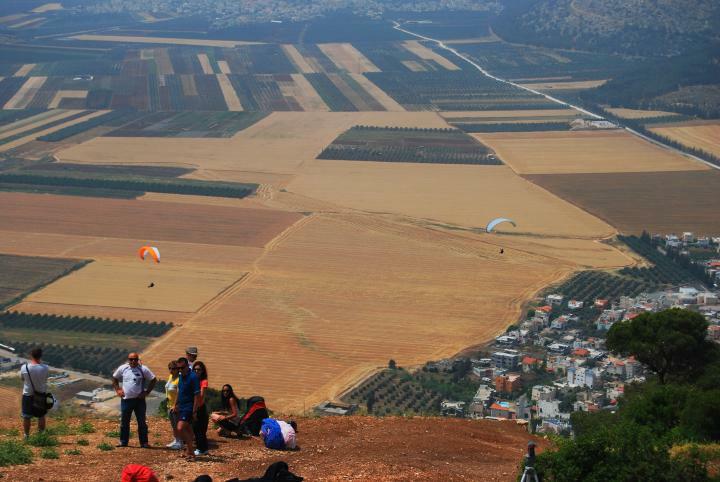 The photo below shows two gliders that jump off the road close to the top, and soar over the Yizreel (Jezreel) valley. More details and photos are expanded in a separate page. There are many references to the Tabor in the old Testament, reflecting its importance. Joshua 19:22: "And the coast reacheth to Tabor, and Shahazimah, and Bethshemesh; and the outgoings of their border were at Jordan: sixteen cities with their villages". Judges 4:6" And she sent and called Barak the son of Abinoam out of Kedeshnaphtali, and said unto him, Hath not the LORD God of Israel commanded, saying, Go and draw toward mount Tabor, and take with thee ten thousand men of the children of Naphtali and of the children of Zebulun?" Judges 4:12: "And they showed Sisera that Barak the son of Abinoam was gone up to mount Tabor". Judges 4:14: "And Deborah said unto Barak, Up; for this is the day in which the LORD hath delivered Sisera into thine hand: is not the LORD gone out before thee? So Barak went down from mount Tabor, and ten thousand men after him". Judges 8:18: "Then said he unto Zebah and Zalmunna, What manner of men were they whom ye slew at Tabor? And they answered, As thou art, so were they; each one resembled the children of a king". 1 Samuel 10:3: "Then shalt thou go on forward from thence, and thou shalt come to the plain of Tabor, and there shall meet thee three men going up to God to Bethel, one carrying three kids, and another carrying three loaves of bread, and another carrying a bottle of wine:"
1 Chronicles 6:77: "Unto the rest of the children of Merari were given out of the tribe of Zebulun, Rimmon with her suburbs, Tabor with her suburbs:"
Psalms 89:12 "The north and the south thou hast created them: Tabor and Hermon shall rejoice in thy name." Jeremiah 46:18 "As I live, saith the King, whose name is the LORD of hosts, Surely as Tabor is among the mountains, and as Carmel by the sea, so shall he come." Josiah 5:1: "Hear ye this, O priests; and hearken, ye house of Israel; and give ye ear, O house of the king; for judgment is toward you, because ye have been a snare on Mizpah, and a net spread upon Tabor." According to Matthew 17:1-13 (and Mk 9:2, Lk 9:28), Jesus is transfigured before Peter, James, and John on the "mountain". There are several candidates, such as Hermon (the tallest in Israel) and Tabor. Both are also referred as high mountains, see Psalms above ("Tabor and Hermon shall rejoice in thy name"). Tabor is closer to the center of Jesus activities, and also it is referred as "the mountain" in other texts. 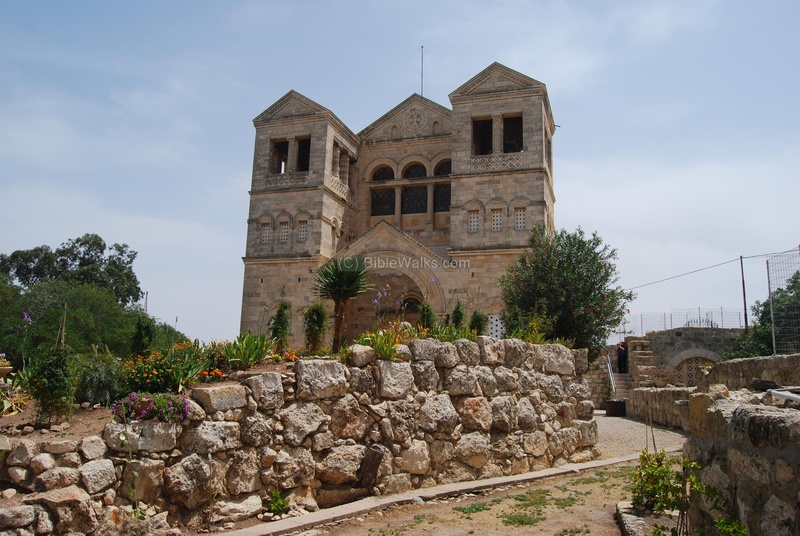 According to old traditions, Tabor is the holy mountain, and is called "the mount of Transfiguration" . "And after six days Jesus taketh Peter, James, and John his brother, and bringeth them up into an high mountain apart, And was transfigured before them: and his face did shine as the sun, and his raiment was white as the light. And, behold, there appeared unto them Moses and Elias talking with him. Then answered Peter, and said unto Jesus, Lord, it is good for us to be here: if thou wilt, let us make here three tabernacles; one for thee, and one for Moses, and one for Elias. While he yet spake, behold, a bright cloud overshadowed them: and behold a voice out of the cloud, which said, This is my beloved Son, in whom I am well pleased; hear ye him. And when the disciples heard it, they fell on their face, and were sore afraid. And Jesus came and touched them, and said, Arise, and be not afraid. And when they had lifted up their eyes, they saw no man, save Jesus only. And as they came down from the mountain, Jesus charged them, saying, Tell the vision to no man, until the Son of man be risen again from the dead. And his disciples asked him, saying, Why then say the scribes that Elias must first come? And Jesus answered and said unto them, Elias truly shall first come, and restore all things. But I say unto you, That Elias is come already, and they knew him not, but have done unto him whatsoever they listed. Likewise shall also the Son of man suffer of them. Then the disciples understood that he spake unto them of John the Baptist". The historian Josephus Flavius was the Northern commander of the revolt against the Romans at 66-67AD, and fortified the site. He later wrote about it in his book, "War of the Jews". "Josephus ... betook himself to make provisions for their safety against external violence; and as he knew the Romans would fall upon Galilee, he built walls in proper places about Jotapata, and Bersabee, and Selamis; and besides these, about Caphareccho, and Japha, and Sigo, and what they call Mount Tabor, and Tarichee, and Tiberias". "But now Vespasian went about other work by the by, during this siege, and that was to subdue those that had seized upon Mount Tabor, a place that lies in the middle between the great plain and Scythopolis, whose top is elevated as high as thirty furlongs and is hardly to be ascended on its north side; its top is a plain of twenty-six furlongs, and all encompassed with a wall. Now Josephus erected this so long a wall in forty days' time, and furnished it with other materials, and with water from below, for the inhabitants only made use of rain water. As therefore there was a great multitude of people gotten together upon this mountain, Vespasian sent Placidus with six hundred horsemen thither. Now, as it was impossible for him to ascend the mountain, he invited many of them to peace, by the offer of his right hand for their security, and of his intercession for them. Accordingly they came down, but with a treacherous design, as well as he had the like treacherous design upon them on the other side; for Placidus spoke mildly to them, as aiming to take them, when he got them into the plain; they also came down, as complying with his proposals, but it was in order to fall upon him when he was not aware of it: however, Placidus's stratagem was too hard for theirs; for when the Jews began to fight, he pretended to run away, and when they were in pursuit of the Romans, he enticed them a great way along the plain, and then made his horsemen turn back; whereupon he beat them, and slew a great number of them, and cut off the retreat of the rest of the multitude, and hindered their return. So they left Tabor, and fled to Jerusalem, while the people of the country came to terms with him, for their water failed them, and so they delivered up the mountain and themselves to Placidus". This photo is part of a collection of aerial images of BibleWalks's partner. For purchasing details, visit our shop. Mount Tabor's winding road access is seen in the following photo. On top of the hill there are 3 sections: the Franciscan basilica area (right side), the Greek church area (left side), and the Flavius ruins (in the area before the fork). The sea of Galilee lies between the two lines of the hills in the background.